Wichita food trucks serve up great food and great entertainment when they get together for Food Trucks at the Fountain. Along with a gathering of Wichita food trucks like The Flying Stove, LumpiaPalooza, The Brown Box Bakery, Hot 2 Trot Gourmet Hotdogs, Sunflower Espresso, Let’m Eat Brats, and many others, you’ll also enjoy live music and a donation-based yoga class at most events. It’s a fun and festive atmosphere in downtown Wichita. 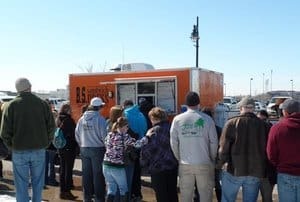 The food and live music start at 11 a.m.
Food Trucks at the Fountain is held at the WaterWalk pavilion from 11 a.m. to 2:00 p.m. on the last Sunday of the month from March through October. You’ll find the WaterWalk Pavilion downtown near Kellogg and Main, just north of the Gander Mountain and south of Century II, by the Wichita Boathouse. Time: 11 a.m. – 2:00 p.m.